Forest Holidays, Thorpe Forest03330 110495work Holiday ParkThorpe Forest Cabins lie in woodland on the banks of the River Thet, close to where the Norfolk and Suffolk borders meet. Here you can escape to a luxury cabin, a treehouse even, with between one and five bedrooms, most with hot tubs! Enjoy the peace and tranquillity of a leafy setting with riverside walks. The forest itself is a delicate patchwork of pines, heathland and broadleaf trees, and home to a rich variety of native British wildlife, including red squirrels, deer, woodlarks and nightjars. At Forest Holidays, you can take a stroll along one of the many woodland trails, hire bikes for all the family and even try your hand at archery. Or why not join the Forest Ranger and learn how to identify animal tracks, head off and explore the forest by night, or experience a bush skills walk where you can learn essential forest survival skills such as foraging for wild foods, shelter building, natural navigation and fire lighting. For those looking for a slower pace of life, then you can sit back and relax in your private hot tub and watch the canopy of trees swaying in the breeze above you as the birds flutter past. The accommodation is the last word in luxury, with a range of cabins sleeping 2-10 people they all have modern, fitted kitchens, spacious accommodation and stunning forest views. Many are pet-friendly and have log burners and under floor heating. At the very top of the range are the bespoke Golden Oak Tree Houses that take forest living to a new level. With luxury cabins for families, groups and couples there really is something for everyone, and as you can bring up to four dogs in the pet-friendly cabins it means no-one has to be left at home. Thorpe Forest Cabins lie in woodland on the banks of the River Thet, close to where the Norfolk and Suffolk borders meet. Here you can escape to a luxury cabin, a treehouse even, with between one and five bedrooms, most with hot tubs! Cycle storage available. There is a 'Forest Retreat' where guests check-in and can buy gifts. Within the Forest Retreat guests can also enjoy a bite to eat and a drink - whether it's a light lunchtime snack and a glass of something cold while sitting out on the decking in summer months, or a warm hot chocolate sitting next to the log fire in the winter. Enter LOVENORFOLK to save 5% at www.forestholidays.co.uk when you book and holiday by 31 December 2019. 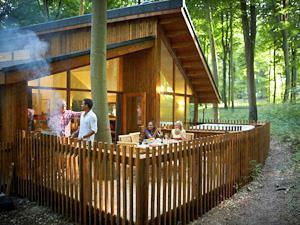 The 5% discount can be taken across all cabin types at Thorpe Forest.